I am not a Starbucks fan—I had like two to three Venti cups way back some three years ago and that was all about me trying coffee the shop way. I went with a friend to the nearest Starbucks just across the building I work at and landed my hands on one of their infamous Holiday Drinks. Yes, the Starbucks Holiday Drinks that will get you stickers to collect for your 2017 planners. For my midday coffee trip, I opted for the Starbucks Peppermint Mocha. I am no expert, but as a first time drinker who can actually give recommendations based on what I think is good, here’s the verdict: for a non-SB fan, I’d give it a 7/10. If you’re looking for a stronger kick of caffeine that will wake you up, I say this drink is not the one for you. It tastes more like it’s chocolate mint than it is coffee. However, the blend is quite perfect that first time drinkers won’t find it weird. It’s actually something that will give you a feel of the holidays: sweet, relaxing, and crisp. The way they present it… total eye candy! I loved how it tastes but the back lash is I got quite acidic for the rest of the day after drinking it. And it also has a real strong sweet aftertaste. Something that will encourage you to get a glass of water afterwards. Nonetheless, the real treat here, that might work for younger coffee drinkers, was with the whipped cream and the sprinkles. When you get to the bottom part, you would be tasting a combination of chocolate, vanilla, and mint that would feel like you’re sipping a mouthful of melted chocolate bar. Would I recommend it? Yes, I would. 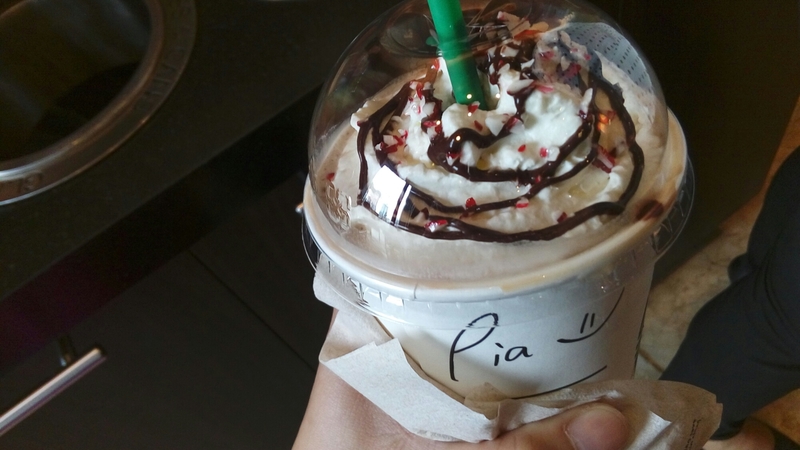 But again, if you prefer coffee, this Starbucks Holiday Drink won’t give you a taste nor aroma of one. ← Why am I loveless, you say?